Former Environment Minister Phil Hogan has said people will be forced to pay more income tax if they do not pay water charges. 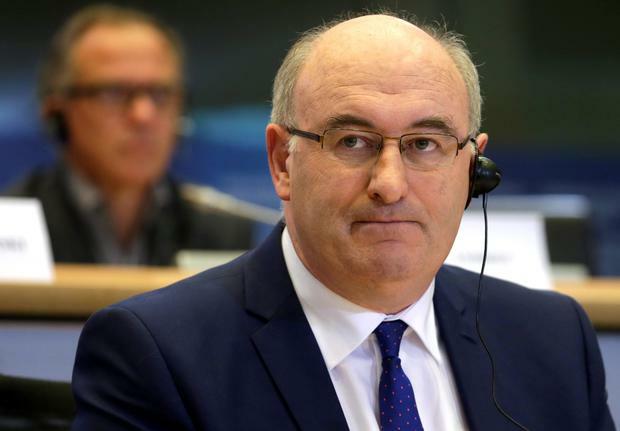 The Kilkenny TD, who oversaw the establishment of Irish Water, was speaking as he officially resigned as a TD to become the new European Union Agriculture Commissioner. He said people have the choice of either paying more income tax or “paying as you use” for water. “Water is not free,” he aded. “It cost €1bn a year to supply water to all of the people of this country so we either pay more on income tax to get the systems we have in place which are not adequate at all for the future development of our country or we pay as we use. "It’s never easy, people right across the European Union are paying as you use at the moment, people in Northern Ireland are paying for water through their service charges." Asked about Saturday’s massive countrywide demonstrations against water charges Mr Hogan said no-one will able to get rid of the new charge. “People are entitled to protest, they are entitled to make their voice known,” he added. He said the Government was forced to introduce water charges because the country was “broke” and dependent on funding from the Troika. Speaking to Newstalk, Mr Hogan said the Troika are “paying for the people who are marching tomorrow if they are public servants or on welfare or if they are getting any particular service”. “This is where we have been getting our money for the last number of years because we were broke and unfortunately that has a huge impact on people’s personal disposable income but also their lifestyle,” he added. He said the introduction of water charges in Ireland was “predicated by the unsavoury situation of the Troika” which forced the new tax on the county. He said the Troika was still looking over the shoulder of the Government despite exiting the bailout programme. Mr Hogan said he would like to have had more time to introduce water charges over a longer time frame but he was under pressure from the Troika to implement the measure.